A spreadsheet has always been a strong (if fairly literal) analogy for a database. A database has tables, which is like a single spreadsheet. Imagine a spreadsheet for tracking RSVPs for a wedding. Across the top, column titles like First Name, Last Name, Address, and Attending?. Those titles are also columns in a database table. Then each person in that spreadsheet is literally a row, and that’s also a row in a database table (or an entry, item, or even tuple if you’re really a nerd). It’s been getting more and more common that this doesn’t have to be an analogy. We can quite literally use a spreadsheet UI to be our actual database. That’s meaningful in that it’s not just viewing database data as a spreadsheet, but making spreadsheet-like features first-class citizens of the app right alongside database-like features. With a spreadsheet, the point might be viewing the thing as a whole and understanding things that way. Browsing, sorting, entering and editing data directly in the UI, and making visual output that is useful. With a database, you don’t really look right at it — you query it and use the results. Entering and editing data is done through code and APIs. What’s nice is that the idea of spreadsheets and databases can co-exist, offering the best of both worlds at once. At least, on a certain scale. We’ve talked about Airtable before here on CSS-Tricks and it’s a shining example of this. If all you ever do with Airtable is use it as a spreadsheet, it’s still very nice. The UI is super well done. Things like filtering and sorting feel like true first-class citizens in a way that it’s almost weird that other spreadsheet technology doesn’t. Even the types of fields feel practical and modern. Plus with all the different views in a base, and even cooler, all the “blocks” they offer to make the views more dashboard-like, it’s a powerful tool. But the point I’m trying to make here is that you can use your Airtable base like a database as well, since you automatically have read/write API access to your base. So cool that these API docs use data from your own base to demonstrate the API. I talked about this more in my article How To Use Airtable as a Front End Developer. This API access is awesome from a read data perspective, to do things like use it as a data source for a blog. Robin yanked in data to build his own React-powered interface. I dig that there is a GraphQL interface, if it is third-party. The write access is arguably even more useful. We use it at CodePen to do CRM-ish stuff by sending data into an Airtable base with all the information we need, then use Airtable directly to visualize things and do the things we want. There used to be Fieldbook, but that shut down. RowShare looks weirdly similar (although a bit lighter on features) but it doesn’t look like it has an API, so it doesn’t quite fit the bill for that database/spreadsheet gap spanning. Zoho Creator does have an API and interesting visualization stuff built in, which actually looks pretty darn cool. 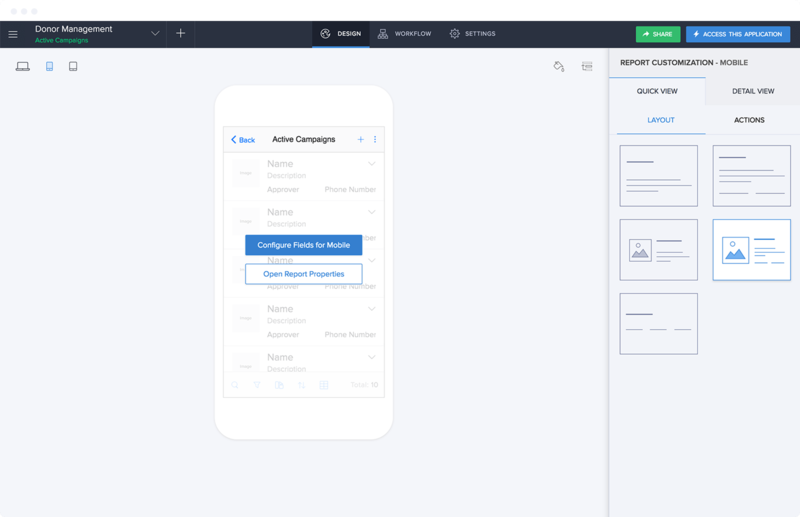 It looks like some of their marketing is based around the idea that if you need to build a CRUD app, you can do that with this with zero coding — and I think they are right that it’s a compelling sell. Actiondesk looks interesting in that it’s in the category of a modern take on the power of spreadsheets. While it’s connected to a database in that it looks like it can yank in data from something like MySQL or PostgreSQL, it doesn’t look like it has database-like read/write APIs. Can we just use Google Sheets? The biggest spreadsheet tool in the sky is, of course, the Google one, as it’s pretty good, free, and familiar. It’s more like a port of Excel to the browser, so I might argue it’s more tied to the legacy of number-nerds than it is any sort of fresh take on a spreadsheet or data storage tool. Google Sheets has an API. They take it fairly seriously as it’s in v4 and has a bunch of docs and guides. Check out a practical little tutorial about writing to it from Slack. The problem, as I understand it, is that the API is weird and complicated and hard, like Sheets itself. Call me a wimp, but this quick start is a little eye-glazing. What looks like the most compelling route here, assuming you want to keep all your data in Google Sheets and use it like a database, is Sheetsu. It deals with the connection/auth to the sheet on its end, then gives you API endpoints to the data that are clean and palatable. Plus there are some interesting features, like giving you a form UI for possibly easier (or more public) data entry than dealing with the spreadsheet itself. There is also Sheetrock.js, an open source library helping out with that API access to a sheet, but it hasn’t been touched in a few years so I’m unsure the status there. I ain’t trying to tell you this idea entirely replaces traditional databases. For one thing, the relational part of databases, like MySQL, is a super important aspect that I don’t think spreadsheets always handle particularly well. Say you have an employee table in your database, and for each row in that table, it lists the department they work for. To find the name of a particular employee’s department, there is no need to put the name of the employee’s department into the employee table. Instead, the employee table contains a column holding the department ID of the employee’s department. This is called a foreign key to the department table. A foreign key references a particular row in the table containing the corresponding primary key. To be fair, spreadsheets can have relational features too (Airtable does), but perhaps it isn’t a fundamental first-class citizen like some databases treat it. Perhaps more importantly, databases, largely being open source technology, are supported by a huge ecosystem of technology. You can host your PostgreSQL or MySQL database (or whatever all the big database players are) on all sorts of different hosting platforms and hardware. There are all sorts of tools for monitoring it, securing it, optimizing it, and backing it up. Plus, if you’re anywhere near breaking into the tens of thousands of rows point of scale, I’d think a spreadsheet has been outscaled. Choosing a proprietary host of data is largely for convenience and fancy UX at a somewhat small scale. I kinda love it though. The post The Whole Spreadsheets as Databases Thing is Pretty Cool appeared first on CSS-Tricks. And then he applies the idea to putting images on websites in 2019. The post “the closest thing web standards have to a golden rule” appeared first on CSS-Tricks. Over the past year, I didn’t make any progress on one of my main goals. So, what the hell happened? The internet is littered with similar tweets and blog posts. Inboxes are filled with TinyLetters of resolutions and there’s no shortage of YouTubers teaching anyone who will listen how to have their best year ever. But very few people follow through on their goals. This might be even more true in the design and development world, what with the plethora of new technologies, languages, libraries, and tools that hit the scene on a regular basis. In my experience, it’s not the goal-setting or telling everyone about said goal that’s the problem. It’s step three above. When goals go off the rails, at least for me, it’s due to three main issues: distraction, stress, and lack of interest. Barring unforeseen life events, these three issues are responsible for all those unachieved goals that we struggle with. In thinking about my goals for this year, I decided to start first with deconstructing why I couldn’t reach the one major goal I set for myself last year. So, let’s dig into those three issues and see if there’s a way to prevent any of them happening this time around. Distraction seems to be the big one here. We all have a lot going on. Between job and family responsibilities, other hobbies and hanging out with friends, it’s hard to fit in new projects. As necessary as they are, all those other interests and responsibilities are distractions when it comes to our goals. The key here is to block out those distractions, which is easier said than done. We can’t simply ignore the needs of our families and careers, but we need to give ourselves time to focus without distractions. For me, I’m increasingly convinced that the solution is time blocking. Time blocking is exactly what it sounds like: You block out specific periods of time on your calendar to focus on certain tasks. Time blocking allows you to prioritize what’s important. It doesn’t force you to sit down, crack open a book, or start coding, but it gives you the time to do it. It can also be helpful to block smaller, but just as impactful, distractions on your phone and computer. Closing out browser tabs not related to your task, silencing notifications, and clearing your desk of otherwise distracting items should be part of the routine when you sit down to start working on your task. It’s easy to scroll through Twitter, Hacker News, or even CSS-Tricks and convince yourself that it’s time well spent (that last one usually is, though) but that time adds up and doesn’t always result in learning or growing your skills like you think it will. Cutting out those distractions and allowing yourself to focus on what you want to accomplish is a great way to, you know, actually accomplish your goals. I don’t care how smart you are, that’s intimidating as hell. Feeling overwhelmed on the web is common place. How do you think it feels as someone just starting out? Combined with all the responsibilities and distractions from the last section, and you have a killer recipe for burnout. Flipping through any programming book (at least for a beginner) causes most people’s eyes to glaze over. The code looks overly complex and it resembles a math textbook. I don’t know about you, but I hated math class and I found it hard to get excited about investing my free time in something that felt a lot like going back to high school. I think the key here is to relate what I learn to some subject that I find fascinating. My plan to overcome disinterest is to work my way towards a project that I want to build. Go through all the basics, trudge through the muck, and then use the concepts learned along the way to understand more advanced tools, like D3.js. Learning is rarely easy. But, sometimes, it’s when it’s the hardest that it pays off the most. I’m convinced that the more we can uncover our own mental roadblocks and deconstruct them, the better positioned we are to achieve our goals. For me, my mental roadblocks are distraction, stress, and disinterest. The three work together to keep me from my goals, but I’m putting plans into motion to overcome all three. Your roadblocks may differ, but you probably have ways of dealing with them, too.